These are some OSR related blogs I've been reading lately. Check out those illustrated Barsoom RPG pages! The return of an old favorite topic: Mystery Maps. 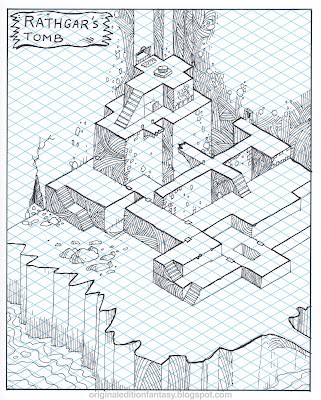 This time in glorious isometric. Rathgar was a brutal warlord who conquered the lands around his territory. He became fabulously wealthy by the time he entered his old age. He spared no expense in building a grand tomb to rest his body for all eternity in. He hired the most powerful wizards and clever craftsmen to make an impenetrable sepulcher filled with deadly traps, horrific curses, and terrible guardians so that no one could rob him of his accumulated riches in the afterlife. Situated on the edge of a treacherous cliff, surrounded by fetid waters, it is barely accessible even by the sure footed. 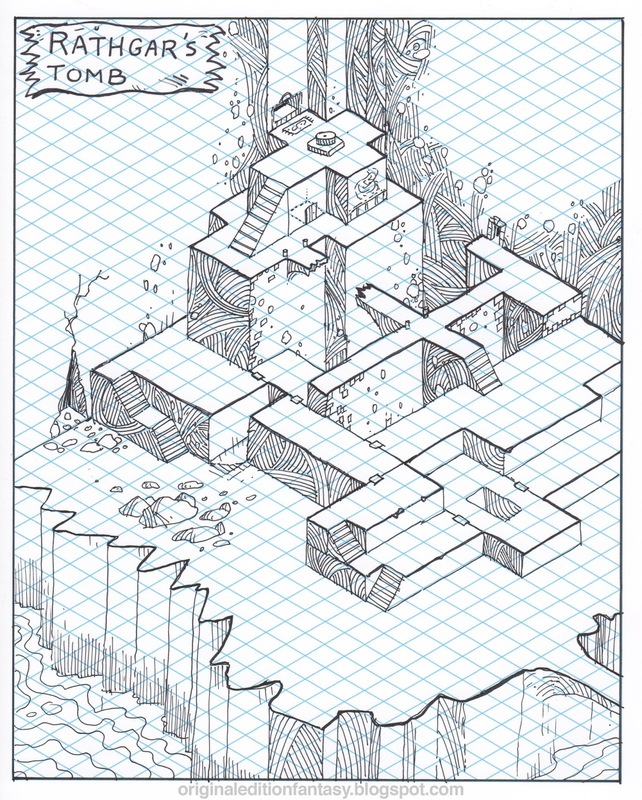 This map is open content for you to freely use in your own games, or even write up an adventure to publish on DriveThruRPG if you like. Enjoy. Snakes! Why did it have to be SNAKES??? Each character may choose one specific thing in which they have a high level of phobia. If they choose this they may add +1 to any single ability of their choice. This phobia can be the dark, rats, snakes, or any other relatively common thing that may be encountered on an adventure. When faced with their phobia a character must make a Luck roll in order to act, if they fail they will be paralyzed and unable to perform any actions for 1d4 rounds. The GM may adjudicate other responses to the character’s deep phobia depending on the situation. What is this Luck roll? Well, in some ways it is just a fancy name for a Saving Throw, but the specifics are for another time and another article. 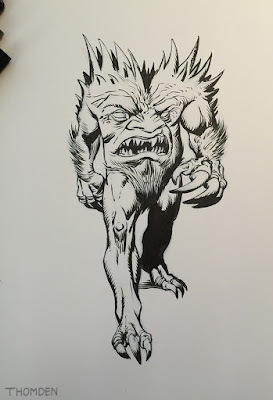 This is the first post of a series I hope to make a regular here featuring a new monster each week. These creatures are intended to be OGL so you can use them in your own adventures and even publish them in your own game books. Each entry will include an original drawing created specifically for this column. These abominable creatures from the depths of the abyss have low intelligence but huge appetites. Their face is on their abdomen with a huge maw on their belly. Insatiable Hunger: a jaw-bellied demon is filled with a never ending need to feed, once it spots any warm prey it will become ravenous and will have +2 on all attacks on that particular victim until it is dead, then it will begin feeding on it to the exclusion of noticing anything else. It then becomes vulnerable suffering a -2 penalty to AC. Lie Feeder: any lie told within it’s hearing range will temporarily give it 1d4 hp for the duration of this encounter. Aura of Despair: anyone within a 20’ radius of a jaw-bellied demon must save or suffer -1 to all attack rolls and -2 to all save rolls for the duration of the encounter. Word of Discord: this takes 1 round to perform, all characters within hearing range who fail a save will not agree on course of actions with other player characters for the duration of the encounter. This must be carefully moderated by the GM. Cursing Blasphemies: the language of a jaw-bellied demon is so foul it can cause those within hearing range who fail to save to suffer 1-3 points of damage and begin bleeding from their ears, they will be deaf for 1-6 rounds. This causes a -1 penalty to AC. The creature stats are OGL, the illustration is © Thomas Denmark. Every year a number of artists participate in an event called Inktober. The objective is to do an ink drawing each day of October and post it on social media with the hashtag #inktober. Over the past couple of years it has really grown into a big event with lots of artists of all stripes participating. Last year I did a few drawings. This year I started late, but I'm catching up. One of the themes I'm working with is Raiders, so it will have the nice benefit of helping to fill the RPG book up with more ink drawings. 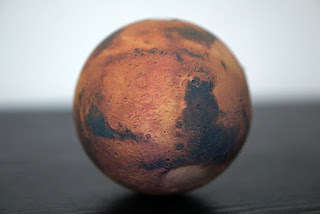 Want something more interesting than that boring old Earth globe on your shelf? 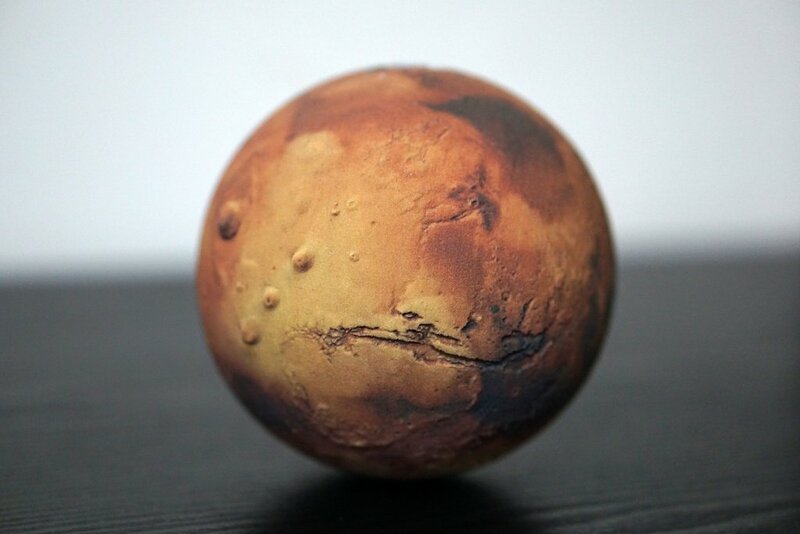 Need a cool prop for your Warriors of the Red Planet game? Look no further than these highly accurate Mars globes. Also available is just about every other body in our solar system. 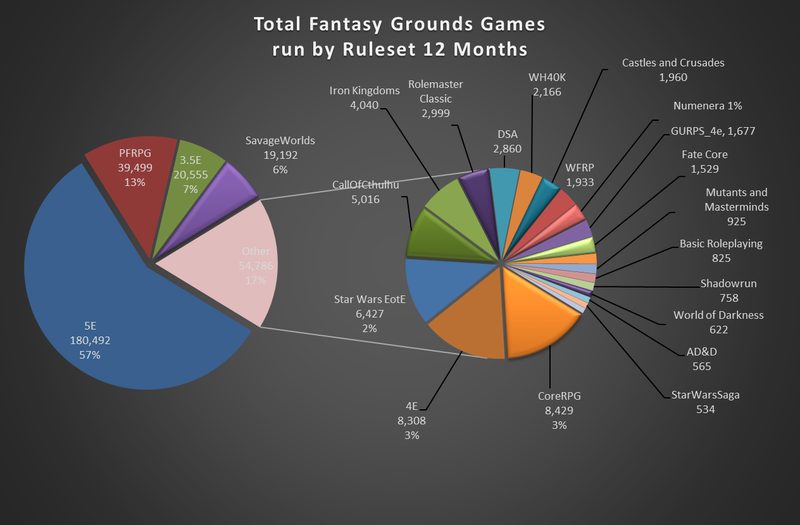 What is Being Played on Fantasy Grounds? 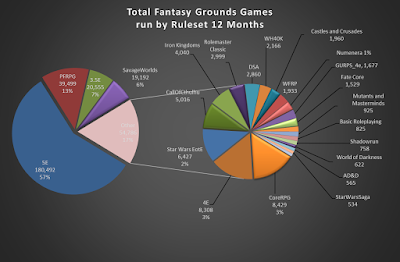 An interesting post on ENWorld about popular RPG's being played on Fantasy Grounds. 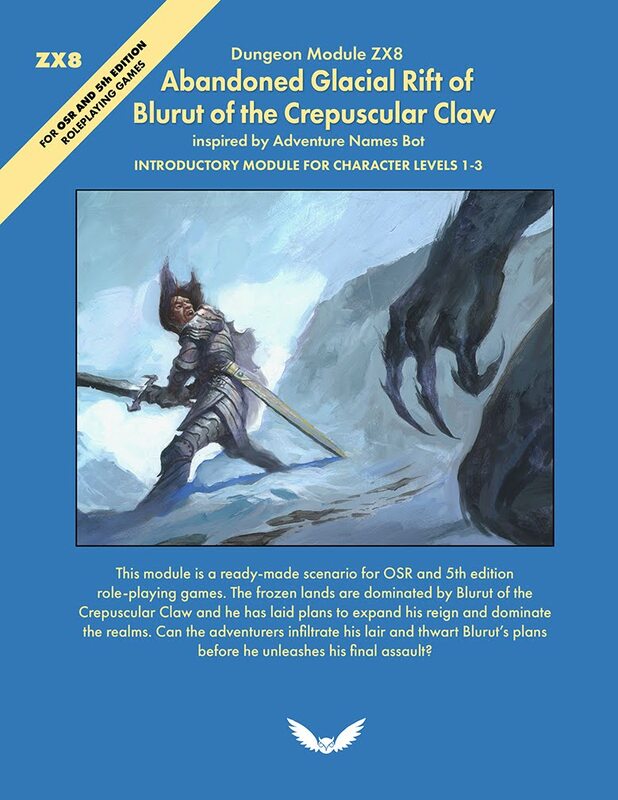 Of particular interest is the representation of OSR games in the form of Castles & Crusades and Basic Roleplaying. Even original AD&D is still on the list. This shows its latest usage stat for 2016, showing which games folks are playing on its platform. As usual, 5E is out way ahead with a whopping 57% share, followed by Pathfinder. Then come Savage Worlds and D&D 3.5, followed by D&D 4E - essentially several versions of D&D, plus Savage Worlds hold the top five spots. Other notable contenders include FFG's Star Wars, Call of Cthulhu, Iron Kingdows, and Rolemaster Classic. In the below charts, "Core RPG" is Fantasy Ground's default core module which allows you to play a range of different games, rather than one of the specific packages. When you can't do the Race/Class combo thing in an RPG, what do you do to make character creation more interesting and customizable? In Guardians the solution was to have Origins, though technically there were a couple race options within origins like alien, robot, or supernatural creature. 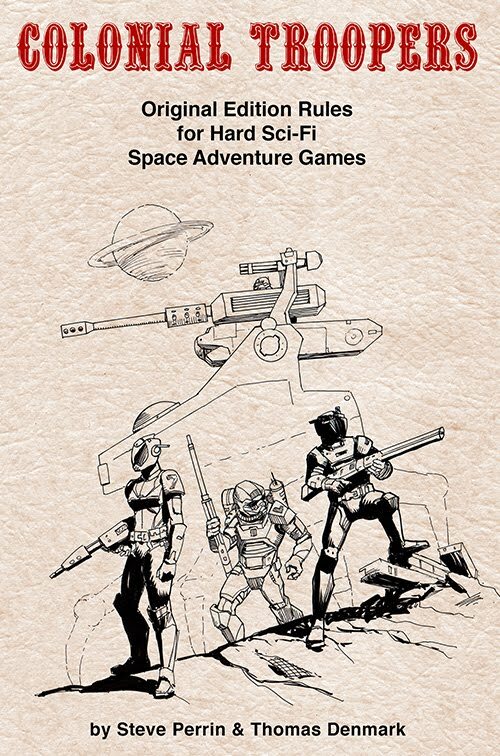 Colonial Troopers has some alien races and synthetics (androids), but that game really is optimized for playing humans. In a game like Raiders though it seems really out of place to have anything other than humans as an option for characters. I suppose you could have Atlanteans*, or go with ancient aliens, or even have some supernatural options like werewolf or something. But those things didn't feel right for the kind of setting the game is intended to evoke. The world is very grounded with just a little bit of the supernatural around the edges. Or more if the game master really wants to take it further, because Raiders is a retro-clone after all and delivers all the power to the GM to create the kind of game he/she wants. So, being stuck with just humans as the race option a different path was added to the character creation steps that felt right and organic to the game world. That is the player chooses a Background. These backgrounds are fairly broad and somewhat generic, but add a lot of depth to the character and allows you to make the kinds of characters you see in pulp books and movies. 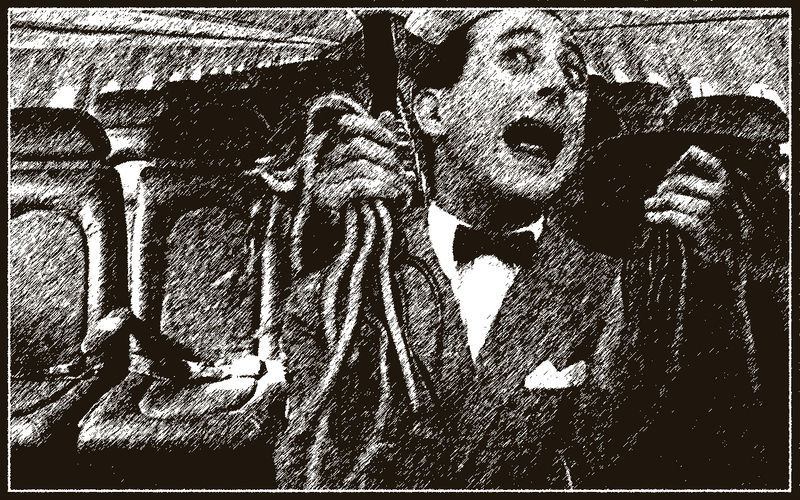 Each character chooses a background that gives them advantages, and some disadvantages, in their adventurous careers. Military: the character has served in the military or was brought up in a military family. Soldiers may recognize and respect them, military officials may afford them special treatment. Government: the character has been a member of a government and has deep ties and friends in the government. This can be advantageous in countries friendly but can be a disadvantage in hostile territories. Even then understanding the ins and outs of bureaucracies can be helpful. Aristocracy: the character is a member of a royal family and grew up privileged, and has aristocratic ties that can aid them. Show Business: the character is a performer, or grew up in a family with ties to show business. Choose one major and one minor talent: singing, dancing, acting, musical instrument. Journalism: the character was a reporter for a newspaper and has deep ties to the field of journalism. They are always seeking the truth, or the best story they can write to sell copies of their work. 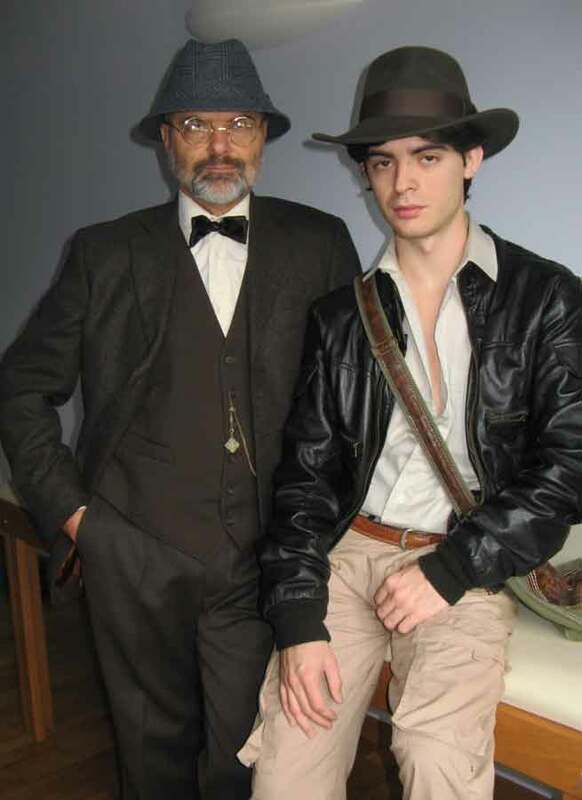 Science: the character specializes in a field of science like Archaeology, Paleontology, or Chemistry. When dealing with matters that fall within their science knowledge they have an advantage, often reflected as a bonus to a die roll appropriate to the situation. Law: the character is a lawyer and understands how to navigate the maze of legality. This can be a bonus to a die roll in situations dealing with the police or judicial systems when the character inevitably runs afoul of the law. What adding this step to the character creation process has done is allowed for a much simplified selection of classes to choose from, and when combined with a background can create a huge variety of interesting characters with depth all while avoiding over complication. That about covers the preview for today. Next preview will be about the Organizations the character can choose to be affiliated with, which will naturally come with benefits, and friends, and enemies, to enrich the game play environment. *now that I think about it, it might be fun to have some add-on packs that detail out extraordinary character options such as Atlanteans that are intended to be fully compatible with Raiders. 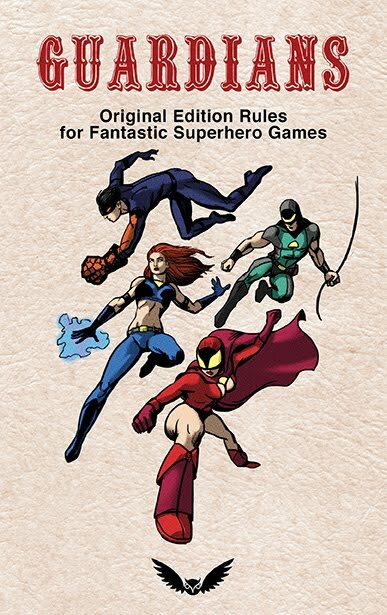 Maybe later, because now the focus is on getting this core rule set done and out into player's hands! This is certainly interesting. A documentary on Dave Arneson, one of the inventors of roleplaying games. I'll be looking forward to this one coming out.